Juicing is very popular, but many people complain that it’s just too hard to stick to only drinking juice, and that they’re constantly hungry. Let’s look at some benefits and get onto some good ideas for recipes, shall we? Right off the bat, one of the biggest benefits here is that soup tastes awesome. It’s also a good way to get in more vegetables and fiber. Let’s take a look. The convenience of souping can’t be understated. 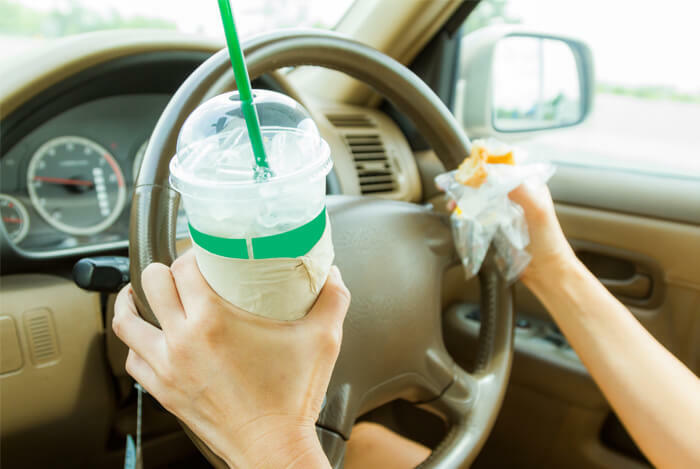 Stuck in traffic and hungry? Do you think you can chow down on a salad? I mean you could – but that’s definitely more accident prone than sipping soup out of a thermos. Throughout the busy work day, all you need is a microwave, and you’re golden. Great, so it’s convenient. That’s really nice, especially with our busy twenty first century lives, but how is it healthy? Well, number one? Fiber. I’ve already beat fiber into the ground by talking about high fiber foods, but it can’t be spoken about enough. In this generation, we are terrible with our fiber intake. According to the UCSF Medical center, the average Joe or Jane should be getting around 25 to 30 grams of fiber per day. But, at best, we get half of that. 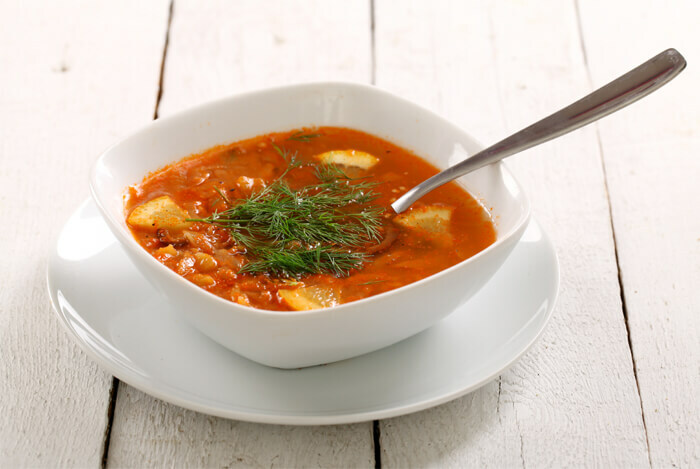 One of the key differences with soup is that if you add some high fiber vegetables like corn, beans, or lentils, you won’t sacrifice flavor. A key concern of many people seeking better nutrition and a more balanced diet is getting more vegetables. Outside of the usual salad here and there, it may not be that easy for people to get a good amount of vegetables throughout the day. 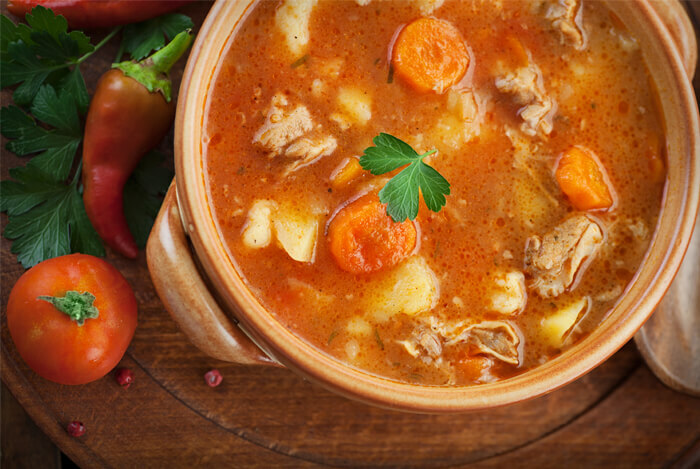 Luckily, many soups are packed full of vegetables, and incidentally, the nutritional benefits that come with them. You can throw any number of vegetables into a good broth, including, but not limited to: beets, celery, broccoli, mushrooms, carrots, peas, celery, cabbage, and zucchini. The taste and consistency of these vegetables changes as the vegetables cook and soak up the flavors of the broth. 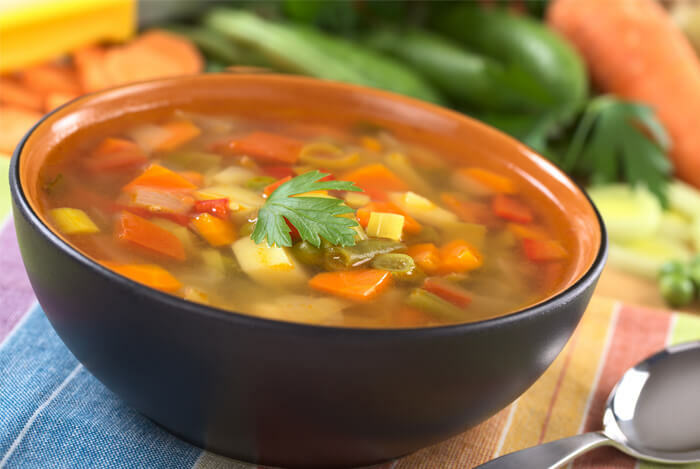 If you don’t like the way certain vegetables taste, or don’t like their texture, adding them to a soup is a great way to fit them into your diet. Let’s go over just a few good recipes, and then I’ll let your creativity takes over. Like I mentioned before, I’m not a fan of lentils most of the time, but lentil soup is pretty good. Lentils have a heavier texture in soup than your run-of-the-mill watery soups, but have a lot of health benefits on their own. This recipe is inspired by Chowhound, but I’ve simplified it to my liking. Chowhound says to cook the vegetables first, but personally, I like to stew things. It’s really up to you, there’s no wrong way. It will save time to cook the vegetables first, but putting everything into a pot on medium heat and leaving it alone isn’t very much work either. This one is pretty classic. And another easy flexible recipe that you can tweak to your liking. First, brown the meat in a pan. Then throw everything into a pot and bring it to a boil. Then take the heat down to low/medium. Stir it every once in a while, and cook it for about half an hour. Then bring the heat even lower. The taste will change as it sits there on low heat and the vegetables absorb the taste of the broth and other vegetables. Yum yum. I found this one on Real Simple, and I haven’t tried it. But it just sounded so good that I felt like I had to share it. 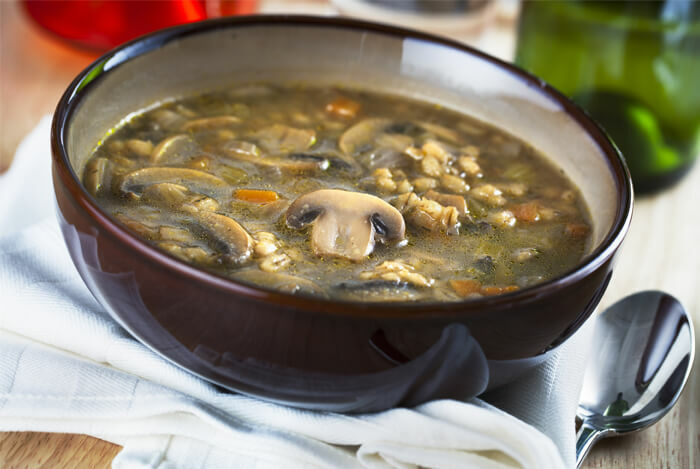 It’s mushroom barley soup. I really like mushrooms…and barley, so this one has to be a winner. Cook the vegetables in a pan for about 10 minutes and add the spices. Then transfer everything into a large pot with the broth and simmer for about half an hour. You’ll notice I added vinegar, and that’s because I feel like mushrooms go well with that sweet and sour flavor, similar to Tom Yum Soup, which is a lemon grass based Thai Soup. It could also be really good with some Cayenne pepper to boot. Be creative, it’s hard to mess up soup. 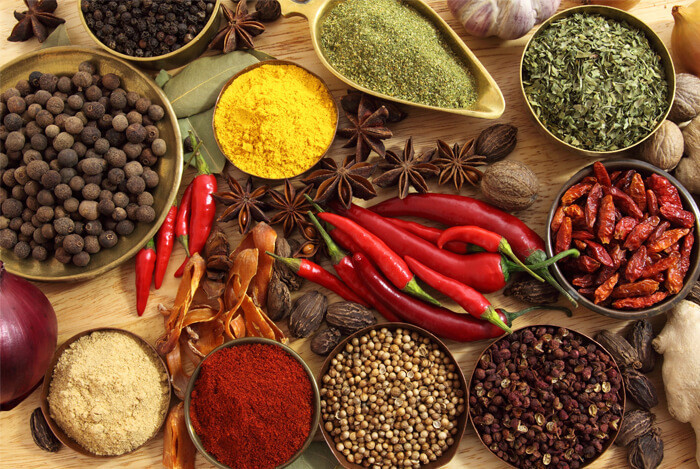 You can always adjust the flavorings with spices, or decrease the flavoring by adding more broth. The kitchen is your oyster! 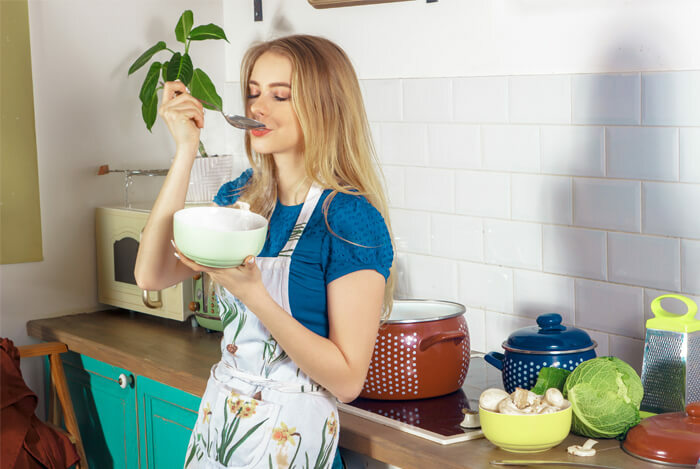 We’ve gone over the benefits of souping, which include convenience, ease of getting additional fiber into your diet, and having a higher amount of vegetables and spices in your diet. I know I didn’t throw too many recipes out there, but the ones mentioned are simply to spur your creativity. 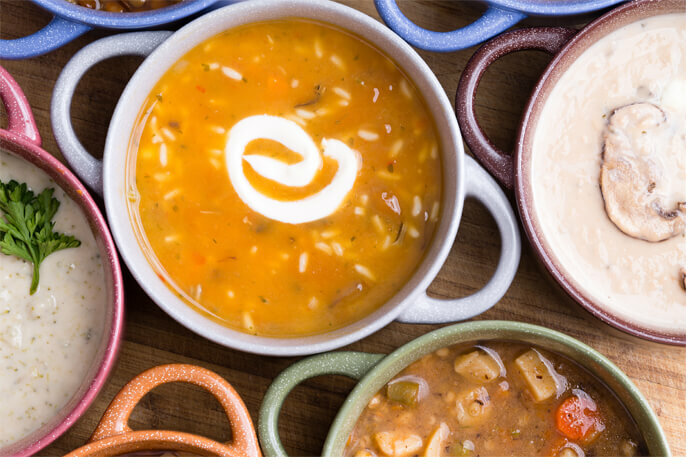 What’s your take on souping? Have anything else you’d like to share? Let me know in the comments below!